Do you prefer dark, vampy and mysterious? In the Navy from Miss Ashleigh is absolutely that! This is the second of the polishes by Miss Ashleigh, sent to me from Ella Ann Cosmetics and I'm quite pleased with it. 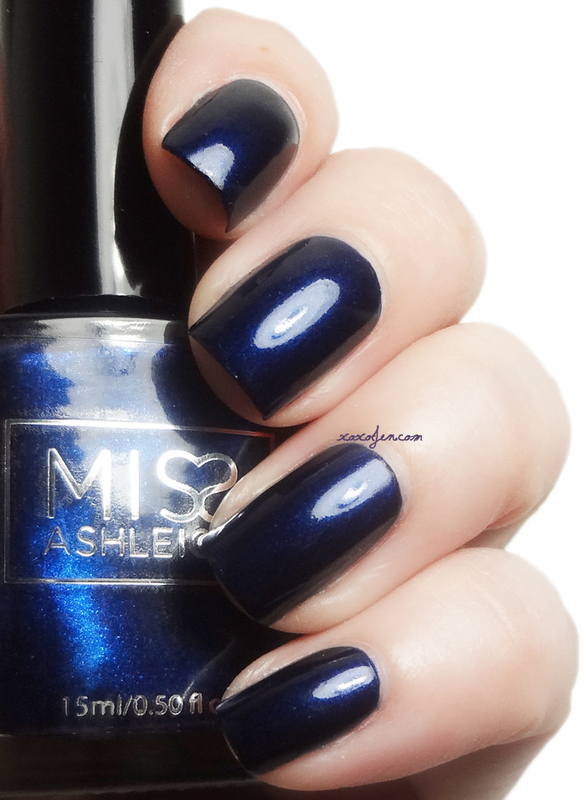 In the Navy is a deep blackened blue and where the light hits the nail is so glowy! The formula is fluid and fairly easy to control. As with some shimmers, use care on the second coat as not to disturb the first coat. This was opaque in one coat but I always use two to insure even coverage for photos. I hope you'll give the Miss Ashleigh line a try. I think you'll be glad you did! In The Navy and many other beautiful shades are available at Ella Ann Cosmetics. Such a deep rich blue! hehe yep, agree with that! Halloween definitely feels like it's own season.